readying the Potting Shed for planting! I planted some instant blooms for inspiration . . .
from a consignment shop instead of a nursery. for tucking in a few violas and a bird nest. from my dish garden, providing a quick flower fix. terra cotta pots, tools, a few bulbs, and bird nest. 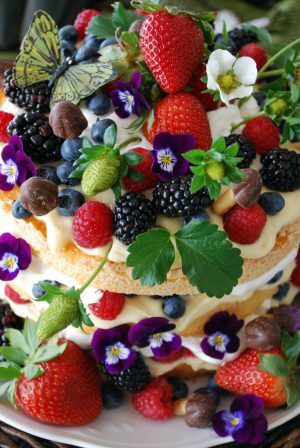 as a pedestal for a round floral tray. . .
and are ready for early spring planting. promise of spring (and pollen ;) to come. for Spring mantles, tabletops, dining and more! You can find Monday’s Spring inspiration, here. Love to know where you got the iron window box. Hi Glenna, My window box came from here. Thank you & have a sunny day. ahhhh, your photos are so refreshing! Perhaps Spring really will come after all. However, rumor has it that here in central IL, we’re expecting 3-5 inches of snow tomorrow, March 12th! Love your work…love the three trays! Love the new gloves and tole trays, but it’s all pretty! Beautiful ! Love the tole trays ! I love everything about this, Mary. 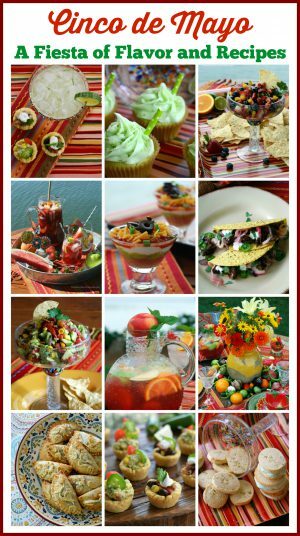 Your use of tole trays is totally awesome! I love your potting shed. The black tole trays are wonderful. Beautiful, Mary. I was looking forward to seeing how you dressed the shed! Breathtaking! I could sit on your front porch all day long! Your door wreath is sooooooo pretty! What a beautiful “Welcome Home” for Spring, she has been gone far to long !! The little bunnies so cute, and love those old watering cans ! p.s Thank you for your talents you share, and the time you take to answer questions, Thank you! Looks so pretty , like Spring. Love the bunnies. How did the moving of the potting shed go? Are you happy with it’s location? I love looking at it!! Great post. Love the beginning buds of it all. They always say not to plant until Mother’s Day in our area. There still is some of that white (now black) stuff around our parts. How is the new location of the potting shed working out? I had to grab another cup of coffee as I knew I would be at this computer for a while swooning over the incredible displays of your garden shed porch…you slam dunk the decor of you garden shed each and every time..Love how you displayed the tole trays so beautifully…I must turn one of mine into a wonderful wreath like yours!…Beautiful, beautiful Mary!!! So great to “party” with you! Beautiful, Mary! The wreath and tole tray is such a creative idea. 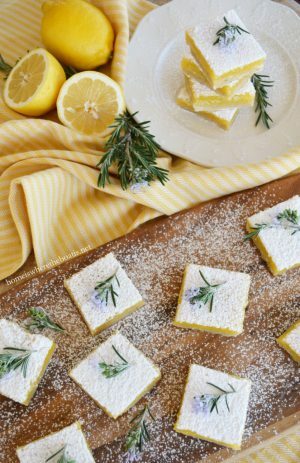 you’re ready for Spring, LOVE the tole trays! It’s official – I’m ready for spring now! Love your potting shed – and your toile trays! I second Martina’s comment…Love it all! Your potting shed is so much fun! As always LOVE seeing your potting shed. Thanks for sharing all your spring touches they are gorgeous. 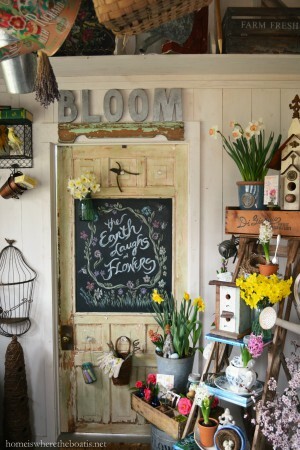 Oh how I love Spring and your potting shed adds some inspiration to my early spring decorations and planting! Thanks for sharing! spring is alive and well out west, but in the midst of a HUGE windstorm, all my blossoms have blown to mexico… dying to get out and play with petter rabbit, but i will just have to enjoy your darling potting shed until the siroccos have past… love seeing you play! Mary I am always so blown away by that potting shed. I think it’s just wonderful and you clearly take amazing care of it. Those violas are stunning! I love your blooming tole trays and especially how you used one in your door wreath. Clever idea! I know you will have so many flowers that you haven’t used before in your new location with a sunny porch. I am in need of new gardening gloves. Keep forgetting to buy some. Thanks for reminding me. I am SO late to the party but couldn’t miss YOUR feature! You hit this out of the PARK, girl. I so love your garden shed and every transformation is better than the last. I love that wreath and the tray behind it is genius. I am jealous that you can have violas now. Just tday it got to 63 degrees so Joe and I got the Christmas wreath off the house and the lit snowman put away!!!!!!!!!!!!!! Thurs. the high will be 29!!!!!!!!! Today was a BIG TEASE!!! I love every thing you do, Mary. Mary, it’s always a delight coming over to see your potting shed! The new sunny location lends itself to new displays. Love the wreath on the front door with the pocket for planting! i just love that potting shed everytime I see it. I seriously want to move into it. I am chomping at the bit so start some spring planting but may hold off just a bit. we did plow our garden over the weekend. All those gorgeous trays at one shop? You must have found someone’s collection. They are perfect for stand in till spring. Can you believe it was in the 80s today and tomorrow night is supposed to be freezing again? I fear we will skip from winter right into summer at this rate. Your potting shed is full of blooms! The tole tray behind your wreath is so clever. We had “warm” weather yesterday, and today it will be freezing again. This looks wonderful Mary- I love those clay pots randomly displayed in the window box. I adore violas even more than pansies–can’t wait to see how many “volunteers” I will have this spring! I found a watering can that had a very vintage look like the one near your black bunny on the left at a store recently. I nabbed it up fast because I figured it wouldn’t last long! Can’t wait for spring to actually arrrive up here! Looks like your getting ready for spring with new things to plant! The tole tray behind the wreath looks fabulous- you rock with ideas! Love, love, love your potting shed! Can’t wait til it’s warm enough for me to play. 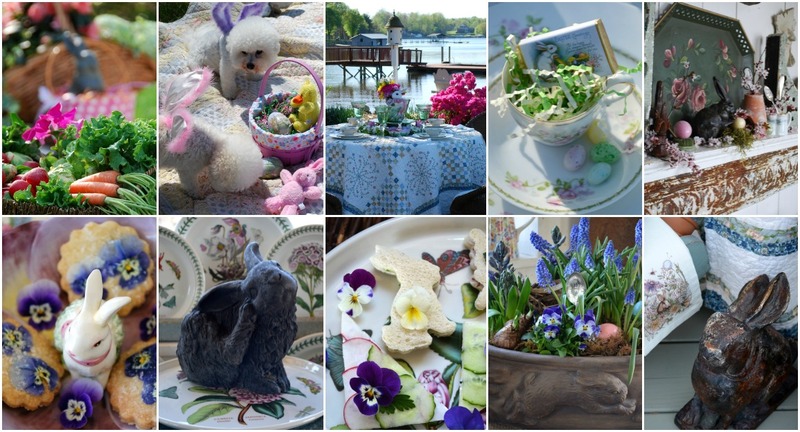 I love how you used the vintage floral trays in your Spring garden décor! I will have to remember that for my decorating…which won’t be for awhile in the northeast! What a wonderful load of inspiration! Your potting shed is amazing! I love how you used your trays with all the old, rustic items. Beautiful! Your wreath is wonderful. I like the idea of using the tole tray. it, you can be a great author. I will always bookmark your blog and will eventually come back down the road.